Three games of chess he'd started that morning. Three games he'd failed to win. One drawn-out draw was acceptable. Two quick-ish defeats less so. He ruminated on what might be for lunch: pawn cocktail, then chicken a la king with queen of puddings to end? Ah, his endgame had always let him down. Would he pick up the check? Enough of Grenvyle's morning at his club. After Jack's last week, another Ipswich institution. 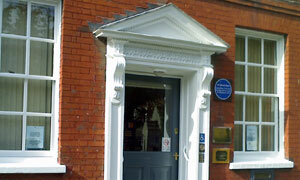 In fact, this is the Ipswich Institute, no less, where Grandmaster G parades his pieces most Friday mornings. Courtesy of Bobby Fischer signing us in, we're in the blue-plaqued Admiral's House, around the corner from the II's better known premises on Tavern Street. Round there, they have the lending library and Pages Cafe. In here, they have study rooms and Chapters licensed restaurant. Through to the back we go, pausing only to read the sign advising you to have a word with the waitress if you're in a hurry. Nice touch, and one that other eateries would do well to emulate. There's a free table and the waitress scampers over with menus. I'd been advised that, given its nature, we could be the youngest people in the room. Tick, just about. I envisioned a predictable range of jaded jackets and uninspiring omelettes on offer. Not so. Goat's cheese salad, feta goujons, Thai fish cakes, anyone? Score one for whatever is the noun form of "contemporary". Friendly lady takes our order -- what'll it be, gents? -- and heads to the shielded corner area that protects us, like an Oz curtain, from core creative catering. Etchings of Olde Ipswiche (Sparrowe's House, Golden Lion) and the odd mirror can't disguise this windowless room's unfortunate lack of character. By contrast, there's a delightfully comfy coffee lounge by reception giving views of trees and St Mary-le-Tower and containing an impressive range of reading material, from The Times to Suffolk Life and, er, back issues of the Saga magazine. Kudos to the lady at the next table, by the way, eating her meal while flicking through The Guardian's Film & Music section. No need to hurry along the staff, for here comes our grub. My, that's a sizeable plate of salmon & sweet potato fishcakes, new pots and side salad. Yes, please, a vinaigrette dressing would be lovely. Dead classy, here. I'm full -- no dessert for me -- though that doesn't stop Kasparov from attacking a defenceless black forest sponge pudding. My indifferent coffee may have gone down better in the front lounge. Still, good service and quality food in a unique members-only location. If it was a car -- Alvis TD 21. If they were passing by -- Nigel Short.